In the picture above north-east is at top left and the image covers 34.3 x 42.9 degrees. Image centre is located at 05:53:44.3, -10:32:16 (H:M:S, D:M:S, J2000) Astrometric data from Astrometry.net. Despite the faintness of its stars, Lepus (the Hare) was known in ancient Greece, as was Orion the hunter, at whose feet it resides, inconspicuously. The hare (or rabbit) is a creature traditionally associated with the Moon, since, with imagination, the man in the Moom features can also be seen as a rabbit. 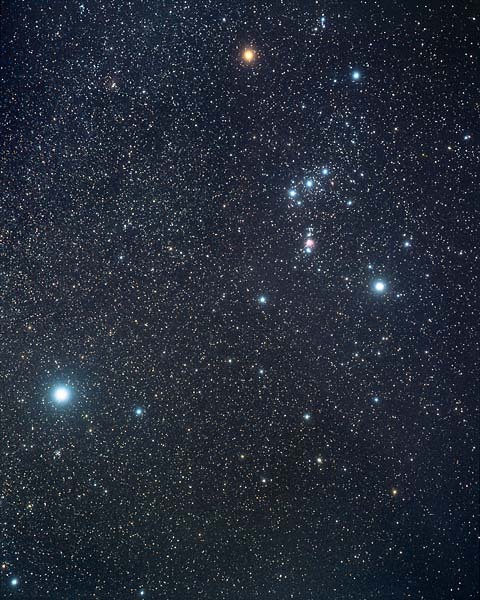 This connection with Orion makes mythological sense, since the Moon was perpetually chased across the sky by the Sun and Orion (which has its own page) is a Sun god. Lepus is a middling-sized constellation, ranking 51 in in size in the modern 88. Its brightest star is Alpha Leporis (Arneb), from the Arabic al-arnab meaning 'the hare'. Also marked on the overlay image is the position of R Leporis, Hind's Crimson star, whse brightness varies over 5 magnitudes (100 times) over a period of 423 days. It is a carbon star and at its maximum is a fine sight in a small telescope or good binoculars. Arneb (α Lep), Neshmet (μ Lep), Nihal (β Lep), Sasin (ε Lep). Constellations adjoining Lepus: Caelum, Canis Major, Columba, Eridanus, Monoceros, Orion.